Alligator Ice excited to release this new consumer product concept. Party Pail comes with a pre-portioned pack of Alligator Ice mix to easily make frozen drinks at home in your freezer. Simply open the pail, follow the easy mixing instructions and enjoy! Contact Alligator Ice today by calling 1-866-594-2867 or by filling out our contact form. Party Pail is available in four awesome flavors! Easy to Mix, Easy to Freeze, Easy to Enjoy! Can be made with or without alcohol. 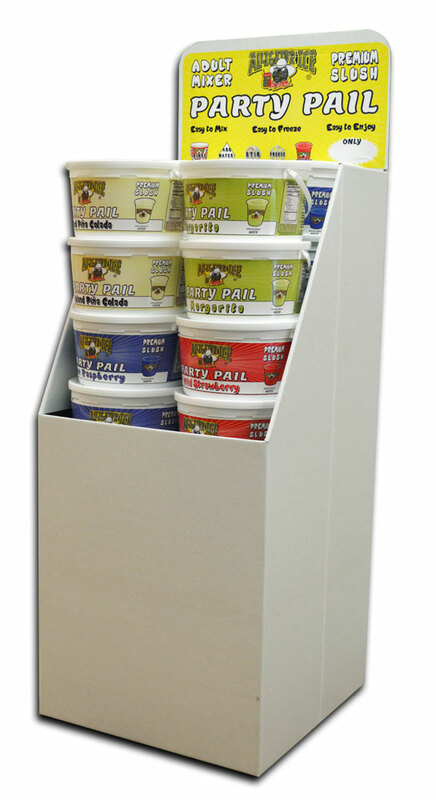 Party pail display available for free as part of product purchase agreement. Display holds 16 Party Pails and is 49" Tall x 17.5" Wide x 17.5" Deep. Contact Alligator Ice to find out how to get a display for your store! stronger drink, add 750ml of choice liquor. 4. Stir mixture thoroughly and place in freezer for 6-8 hrs. 3. Stir mixture thoroughly and place in freezer for 6-8 hrs.